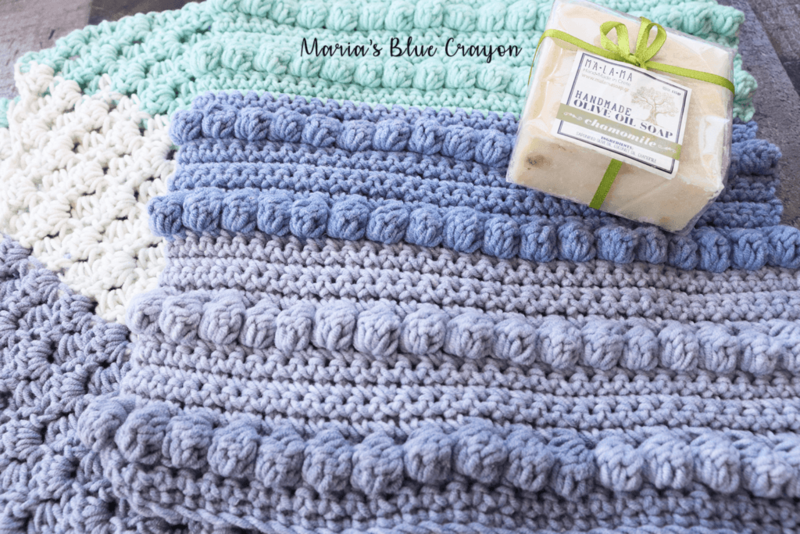 Crochet washcloths are so great for the bath and can be used over and over again. 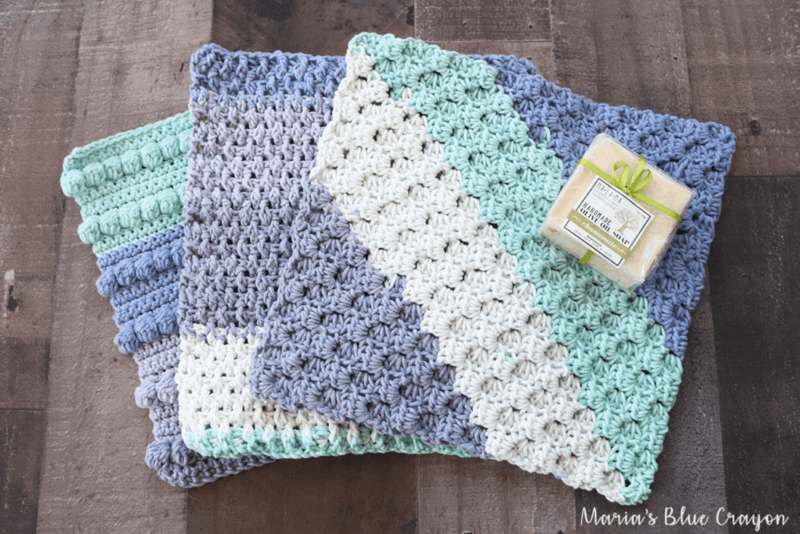 Below are three different crochet washcloth patterns that you can quickly whip up with some cotton yarn! 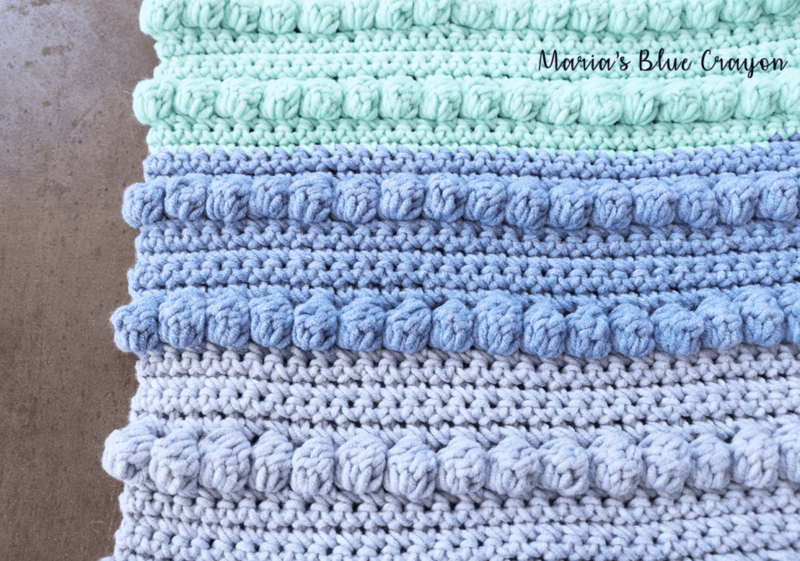 I love using crochet washcloths! I always use them for my son in the bath and the ones I crochet always seem to hold up a lot longer than the ones I buy in the store. Granted, I don’t buy very expensive washcloths in the store but if I can whip up a few with a few dollars of yarn – I’d much rather do that! I also use them for myself when I wash my face or remove make up during the evening. For the washcloths I made, I wanted to make sure there was a lot of texture so removing make up would be very easy. For the first washcloth, I used the corner to corner technique/stitch because it’s one of my favorites! I used half double crochets versus double crochets so I could avoid too many gaps and holes. Plus, I love the texture it creates! Very subtle but so beautiful. The second washcloth I made fun bobbles between rows of single crochet. After I made it, I was hesitant if it would be a good, practical washcloth. To my surprise, it’s actually my favorite one to use when taking off my makeup! The bobble texture was fantastic especially around my eye area when washing my face. The third washcloth I stitched up was an alternating pattern of back and front double post stitches. I thought it would make a fun texture and it did! I’m using it as a washcloth for the bath, but with the great texture I think it would be great for a dishcloth as well! 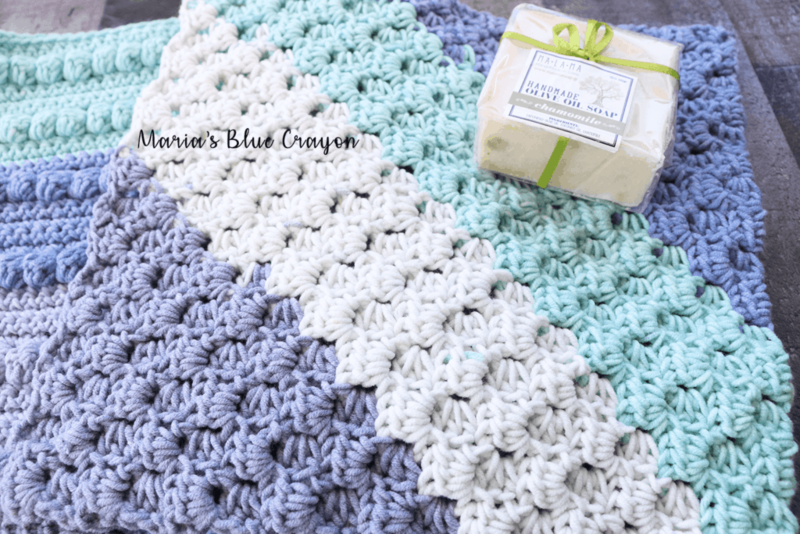 I never used the Caron Cotton Cakes for washcloths or dishcloths before. Although they are made with cotton, there is also some acrylic in there. I was a bit hesitant to try it, but I went for it because it’s so soft! I’ve been using these washcloths for about over a week now and I love them! I have no problems with them even with the bit of acrylic in them. The one thing I find different compared my 100% cotton yarn washcloths is that it takes a few seconds more to really get them soaked and I have to wring them out very well to dry properly. Other than taking a few extra seconds of caring for them, I love them! They are so soft against the skin and so gentle on my face – they are my new favorite washcloths! 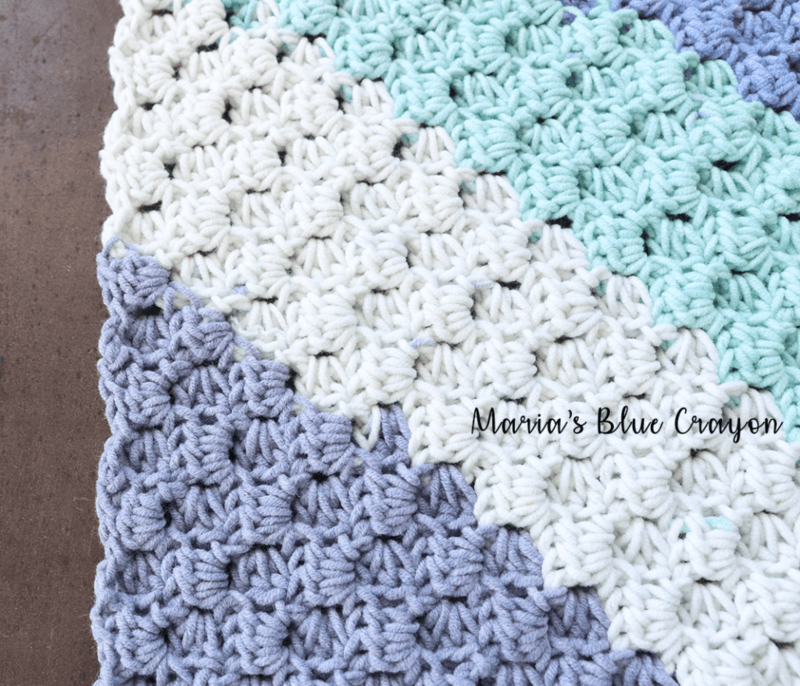 If you are familiar with corner to corner, I used half double crochets instead of double crochets for this corner to corner washcloth. Simply increase until you have 16 diagonal rows and then decrease until you have formed a square. 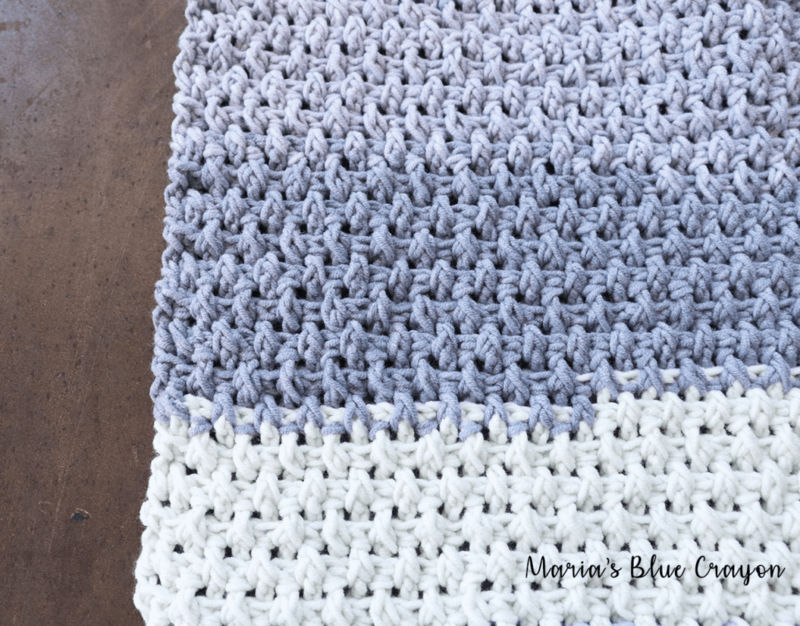 Here is a video of the C2C with half double crochet stitch. Repeat Row 2 until you have a total of 24 rows. 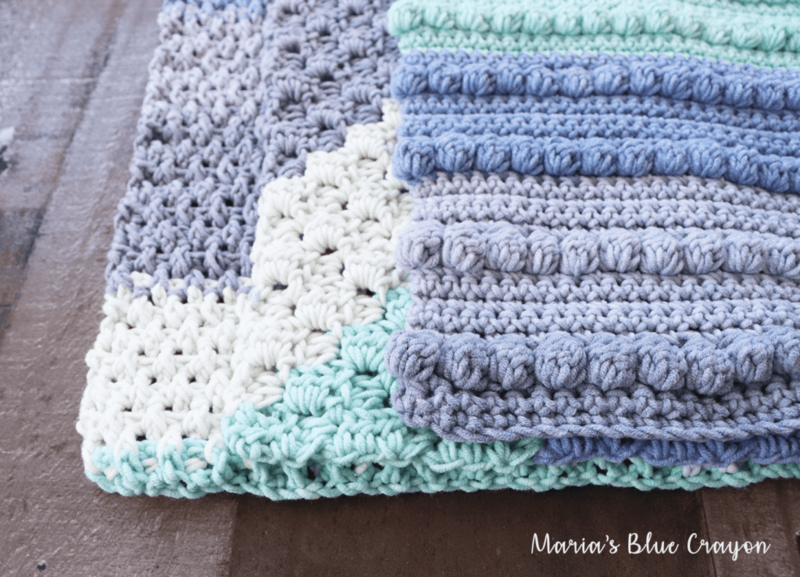 Previous Post: « Spring Crochet Challenge – Crochet to Win! I love the look of your wash clothes. I’m going to try each of your patterns. Thank you for sharing. 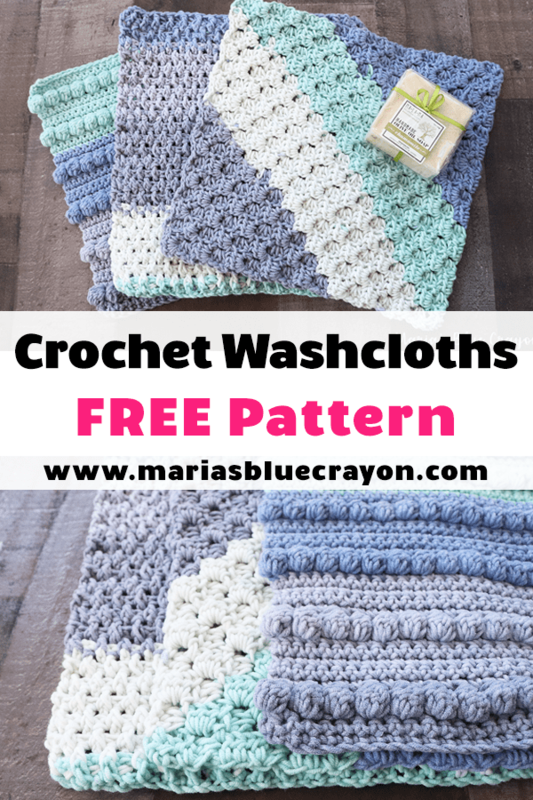 I’m so hoping to get a couple of the patterns made and be aprt of the spring crochet contest, also wanted to say thanks for the tip about the caron cotton cakes…i have used it for so many things, simply didn’t think to make dishcloths or wash cloths with it. I ahve a few of odds and ends that would be perfect for that, or even the soap sacks…thanks again, I love these cloth patterns, going to try the c2c first. I was wondering could you make different wash clothes connect and make a type of afghan. This seems like it could be done and look good. Your patterns look lovely. I’m starting with the f/bpdc washcloth but am stumped already. I’m brand new to reading patterns but what I’m understanding is if we ch 37 and begin row 2 by placing a dc in the 4th ch from the hook we should have 37 st at the end of the row but I have 34. The shape of my washcloth is crazy and I’ve restarted 3 times. What am I not understanding? 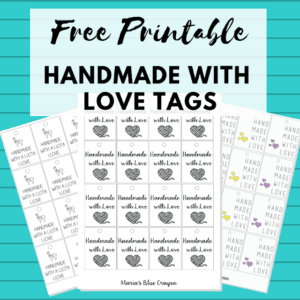 I greatly appreciate your help!